Traditionally, the master bathroom has featured a giant master bath tub. This might be a traditional tub or a jacuzzi – but it seems that more and more clients are asking for something else. They are saying ‘no’ to the large master bath tub. Specifically, the current trend is for smaller, freestanding tubs with larger custom showers that might include body sprays, steam showers, rain bars, etc. Or even for no tub at all. Why? 1. Aging baby boomers. As the largest generation grays, many of them are finding that climbing in and out of the tub is difficult and showers are much easier. This is also reducing the number of tub/shower combinations installed in secondary bathrooms, as people are opting more for showers. Some people are also asking for wheelchair accessible showers, which just means that they are large enough to fit a wheelchair and feature a shower pan, or floor, with roll-in access. 2. People are realizing they do not actually use the giant tub all that often. Busy lifestyles mean less chance to luxuriate in the tub. Instead, a luxury shower allows similar relaxation benefits in less time. New shower technology means that the effect of a whirlpool can be substituted by using body sprays and rain heads. 3. The large footprint of the giant tub is limiting what else can be done with the room and the space. Many people would rather eschew the tub and have more counter space or a larger shower. Privacy for the water closet can also take precedence in the master bathroom. We have even seen a resurgence of the bidet in some bathrooms. All three of these are good reasons – but does this mean the trend is here to stay? Maybe, maybe not. For one thing, not having any kind of tub anywhere in the house can make it difficult to re-sell. Young couples and families with young children are most likely to demand a tub (needed for washing babies). 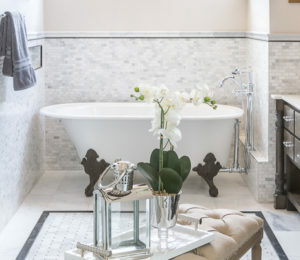 We are suggesting to our clients that they either keep a small tub in the master bathroom or have a larger tub in one of the other bathrooms (which might be better for kids anyway). We are also recommending to our clients that we give some thought to where a tub might be added later, for resale, and possibly even setting plumbing behind the wall to plan for it. It costs very little to plan for it but can be very costly to ignore the possibility. And, although busy lifestyles are with us to stay, it is absolutely the case that styles change. 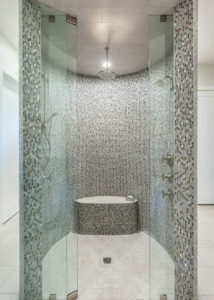 Right now, buyers are looking for large, luxurious showers, sometimes with dual heads, larger counters and mirrors. If they do have a tub, they want it smaller and free-standing rather than built-in to allow for more space. These are, however, just trends. White tiles are also in right now and the chances are that, like different colors of tiles, large tubs will come back in again in the future. Or, perhaps, technology will push things in a different direction again. Some of the new bathroom technologies are very interesting (colored lighting in the shower to “balance your energy” anyone? ), but others, like in-home steam rooms and smart showers are likely here to stay. Smart showers – allowing temperature and spray intensity to be saved and restored via remote control – are likely to intensify the tub to shower trend. It is likely that the shower of the future actually recognizes which household member is stepping in and adjusts the settings accordingly. On the other hand, the tub of the future might fill itself when your alarm goes off – and that kind of technology could direct things the other way. Most likely, large showers will remain popular, while tubs will remain a more personal choice. There will likely be a certain group of people who really enjoy and want a nice long bath, regardless of the trends. Demographics, technology, and style changes will cause bathroom layout trends to keep changing. The key for anyone designing and building a custom home is to consider their own situation and plan for their lifestyle within the home. Each situation is personal, and a home should be full of personal choices. Only then will the home feel comfortable and perfectly-suited to its owners. As Eero Saarinen, the Architect behind the famous “Gateway Arch” in St. Louis surmised, the ‘creators’ will create the shapes that they best relate to and thrive in. 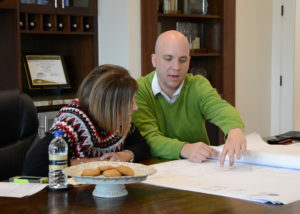 The best way to solve these types of issues is to understand the personal needs of the family and then co-create the solutions with them as their home design emerges. That way, the home truly suits their needs rather than following a trend, which is likely to change later anyway.